On January 27, 1967, a fire consumed the interior cockpit of the Command Module of the Apollo 1 manned space vehicle, which was part of the manned lunar landing program of NASA. Three astronauts were killed in the fire. NASA requested the assistance of Bell Telephone Laboratories, Incorporated (Bell Labs) in analyzing the audiotape that had been recorded during the disaster. The three astronauts were Virgil I. “Gus” Grissom (Command Pilot), Edward “Ed” H. White II (Senior Pilot), and Roger B. Chaffee (Pilot). The space vehicle was situated on a launch pad at the Cape Kennedy Space Center at Cape Canaveral, Florida. The astronauts were in the cockpit much longer than expected that day because of ground communication problems. Grissom expressed his annoyance with this by asking how they expected to get to the Moon if they could not communicate between buildings on the ground. The ground communication problems were being caused by too many people bridging onto the circuits to monitor the audio. Astronaut Walt Cunningham delivered the tape recording to Bell Labs in Murray Hill, NJ on February 6, 1967. Copies of the tape were made, and the original plus one copy were returned to him. Manfred R. Schroeder, James L. Flanagan, Cecil H. Coker, Robert C. Lummis, D. J. MacLean, John R. Pierce, Julius Molnar, Edward E. David, and K. G. McKay initially heard the tape. A team at Bell Labs was formed to analyze the tape; I joined the team around February 7, 1967. NASA wanted to know what was being said and by whom. The tape recording of this final communication was quite emotional, and NASA wisely did not make it public – we at Bell Labs agreed. But with the passage of decades, I thought it would be warranted to document in this paper my memories of listening to and analyzing this recording and its content. Bell Labs formed a team, headed by speech expert James (Jim) L. Flanagan. The other members of the team were Cecil H. Coker, Robert C. Lummis, D. J. MacLean, and myself. But others at Bell Labs, such as linguist Newman Guttman, listened to the tapes and tried to help understand what was being said. NASA invited the team to the Space Center and obtained booking for us on an Eastern Airlines flight from Newark Airport to Orlando, Florida. We checked into a motel and were met there by Frank Borman, who was leading the NASA effort to investigate the disaster. I recall Borman asking whether we wanted to examine the space suits of the three astronauts – we declined. The next day, we went to the Manned Spacecraft Operations Building (MSOB) at the Kennedy Space Center. We were given background, shown diagrams and whatever information we requested, including a tour of the facilities there. NASA was extremely cooperative and open. We wanted to know the actual circuit diagrams of the communication system. But NASA discovered that many changes were being made and not entered on the diagrams. We did receive overall block diagrams though. I remember going to the roof of the MSOB from where I could see the actual launch pad in the distance. The engineer who took me to the roof commented that if the fire had occurred on the following day when the rocket had been loaded with fuel, the explosion would have been huge. It seemed to me that part of the excitement of the space program was the controlled explosion of the lift-off of the rockets. There was an audio stethoscope attached to the chest of White or Chaffee (I do not recall which astronaut). NASA showed us a graph of the recording of the heart sounds. I remember asking whether anyone had listened to the recording, rather than just graphing it. The sensor might have picked up movement and exterior sounds, which would have helped identify who was speaking and moving about. What surprised me was that listening had not been done since NASA’s engineers had become so accustomed to graphs. To help us analyze the audiotape recording, we requested normal speech recordings of the three astronauts so that we could create normal speech spectrograms and also pitch analyses of each of them. We hoped that these normal recordings would help us identify who was speaking and shouting during the disaster. In order to talk, the astronaut had to press a switch on a push-to-talk button on his “cobra cable,” so named because of its shape. There was also a toggle switch on the cobra cable to enable communication outside the cockpit. In its normal position, the capsule voice communication would be an intercom system enabling the astronauts to talk to each other when they had their helmets on. The toggle switch would then enable communication between the capsule and the ground, if that were desired. The audio tape recording had the slow sound of breathing, which was identified as coming from Grissom’s microphone. For some reason, his microphone was always active. There might have been a short circuit in a switch somewhere, perhaps in the push-to-talk switch on his cobra cable. Because of the pure oxygen, the breathing rate was less than in normal air. Pure oxygen was used since the astronauts were concerned about getting the bends if there were a sudden decompression. Much Velcro was used in the space suits and interior of the cockpit, and it was later realized that the fuzzy Velcro burned quickly in pure oxygen. The three astronauts were in the capsule for a long time because of ground communication problems. This delay seemed to bother Grissom, who states “How are we going to get to the moon if we can’t talk between three buildings.” There is some ground communication and periods of system noise. This final recording was extremely emotional to listen too – particularly the repeated listening we made in our attempts to understand what was said and by whom. We all listened separately to the tape, so that there would be no imprint influences of one listener on another. We listened individually on high-quality headphones in a soundproof booth and then met together in a conference room to compare what we thought we heard. Although some of us agreed on the initial “Hey, oh, we’ve got a fire in the cockpit,” there was little agreement on what might have been said after. There was just too much noise and panicked shouting to understand the speech. Spectrographic analyses were performed by D. J. MacLean, and indicated that the normal unstressed speech of the three astronauts had average pitches of 80 Hz for Grissom, 107 Hz for White, and 169 Hz for Chaffee. I performed pitch analyses using my cepstrum pitch determination programs, but that did not offer any final determination of who was shouting. The recording was slowed down while retaining the frequencies of the speech, but that too did not help. In its final report, NASA believed the fire started somewhere in the electrical wiring beneath Grissom’s seat and that the cobra cable was not at fault. Although the current would be small, heat and possible sparks in the pure oxygen environment would have been a unique and unusual situation, possibly with unexpected disastrous results. But after thorough investigation, NASA never discovered definitively the real cause of the fire. We expected that the pitch of shouted speech would increase, but we really had no data on by how much. We also expected that clipping the peaks of a speech signal would degrade its intelligibility, and even more so for shouted speech. We then performed controlled experimentation to evaluate these hypotheses of conventional wisdom. The cockpit communication system included peak clipping. Aircraft radio communication system routinely used peak clipping as a way to increase the power transmitted and thus the range of the radio signal. Clipping made the speech somewhat distorted and noisy, but still mostly intelligible. We believed that shouted speech would be less intelligible, and that the clipping of it would make the speech even much less intelligible. These questions motivated us to perform research to obtain answers. D. J. MacLean and I designed and conducted research in which we first recorded shouted speech and then analyzed it using standard intelligibility measures. We discovered that the pitch of shouted speech was three times higher that of normal speech. We also discovered that extreme shouting reduced its intelligibility, but by only a small amount. Furthermore, Infinite peak clipping, which preserved only the zero-axis crossings, made shouted speech almost as intelligible as normal speech. This research showed that infinite peak clipping improved intelligibility, which was somewhat counterintuitive. The reason was that the vowel-to-consonant ratio was restored to more normal levels by the clipping, thereby improving the intelligibility, which is contained mostly in the consonants. However, emergency communications usually occur with much noise, and noise degrades intelligibility. The technology available to analyze an audio recording has progressed significantly since 1967. What took days of programming and analysis can now be performed in a few minutes using freely available software on a personal computer. Repeated listening back then required rewinding the tape and listening again – now it is just a simple mouse click of a software button. In listening again to the recording, it seems the initial communication was “Hey [noise] Oh, we’ve got a fire in the cockpit.” Using computer software to examine the spectrum of the speech gives a pitch of about 250 Hz. This is far too high to be Grissom; most likely it was Chaffee, in a surprised and somewhat excited voice. I learned on our visit to the Cape in 1967 that the astronauts were frequently experienced test pilots and that they expected fatal disasters to occur during the space program. This risk was accepted and perhaps even added to the excitement of being an astronaut. But it was indeed a sad loss when the disaster occurred. 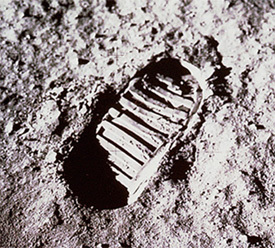 Apollo 1 was the first – and more would follow over the years. To its credit, NASA would learn from the thorough and objective analyses of the causes and experiences of these disasters. The analyses we performed at Bell Labs of the Apollo 1 tape did not provide definitive answers. But it did motivate later research into shouted speech and the effects of peak clipping. I appreciate the memories of their work at Bell Labs on the Apollo 1 tape that were told to me by Bob Lummis and Jack MacLean, and also their comments on drafts of this paper. I applaud Jack for doing what Bell Labs always told us to do, namely, keep notes in a bound notebook, which he did and shared with me. Copies of this paper will be given to the NASA History Office, the AT&T Archives and History Center, the Bell Labs archive at Alcatel-Lucent, and the IEEE History Center. ↑ Telephone interview with Robert C. Lummis on September 3, 2015. ↑ MacLean, Donald J. and A. Michael Noll, “The Intelligibility of Shouted Speech,” Proceedings of the Symposium on the Aeromedical Aspects of Radio Communication and Flight Safety, AGARD/NATO Advisory Report 19, pp. 10-1 to 10-13, December 1969 (London).